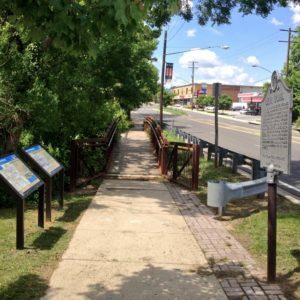 This walking tour will bring you through the historic sites of Bladensburg and the Port Towns, once a deep water port for the tobacco trade, as well as the Battle of Bladensburg area. The Battle route follows Bunker Hill Road to explore the old Georgetown Road and then Bladensburg Road, which is where the bulk of the fighting occurred before the British burnt Washington. Visitors may also download a Walking Tour Brochure. 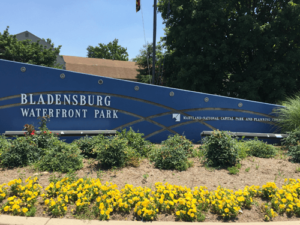 Stop 1 – Waterfront Park – Route 450/Bladensburg Road – Start here for your walking tour. Parking and restrooms are available. The central visitors center has 1812 related information. Cross the Anacostia River, formerly the Eastern Branch of the Potomac, via the pedestrian bridge. 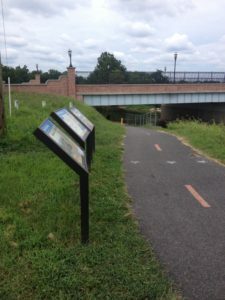 On the other side of the river is the Anacostia Tributary Trails System managed by the Maryland-National Capital Park and Planning Commission. Follow the trail to the right toward Alternate Route 1. This trail follows the modern alignment of the river, which was changed in the early 20th century. The river once flowed closer to the parking lot of the Waterfront Park than today. determine the British location, crossed the Bladensburg bridge in front of U.S. battle lines. Madison is asked to move back to the American Second line (stop 3) by a scout. This point also is the point where the Georgetown Road (now Bunker Hill Road) met the Turnpike. A toll booth had been located here at various points before heading toward Washington. Carleton or Moyer’s Mill was located closer to 42nd Street but was a major point during the battle, denoting the left flank of the American First line. (Today, the road’s old alignment can be seen by the telephone poles still marking the line of the right of way.) American General Stansbury positioned artillery and cavalry units on the west bank of the Anacostia River to defend the bridge and the more easily fordable river bed north of the bridge. After the Americans successfully repulsed the first attempt by British to cross the bridge and inflicted significant casualties, the British over ran these positions and forced American units to retreat; some exiting the field of battle along Bunker Hill Road, others regrouping in support of later phases of the battle. Stop 3 – Cottage City Town Hall – Stop here for restrooms (during business hours). Bunker Hill Road (the Georgetown Road) was the route on which many of the American’s retreated and now forms the rightmost spine of Cottage City. 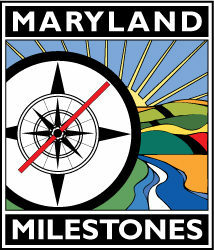 Carlton Mill was located along the road and was the first mill in this part of Maryland. It operated until the late 1800’s and was demolished in the 1950’s. The area was platted in 1870 as a railroad suburb. The plan at the time was to “use ‘cottages, villas, and dwellings,’ using designs that were reminiscent of Andrew Jackson Downing’s Cottage Residences,” published 1842. (Historic Sites and Districts Plan, M-NCPPC 2011). Only one building from that period remains – the Rural Cottage at the Highlands. (c. 1867, second empire style, straight sided mansard roof, overhanging eaves – Historic Sites and Districts Plan, M-NCPPC, 2011). The area was reconfigured in the 1880’s and again in 1914. Local builder Charles Lighbrown began construction of one story bungalows along Bladensburg Road and 41st Avenue, after World War I and began the modern story of Cottage City as a Washington D.C. suburb. 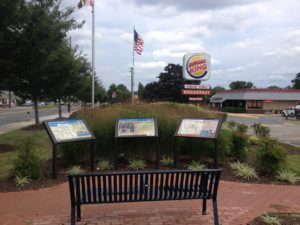 Stop 4 – American Cabinet and Second Line of Defense – Near 40th Avenue and Bladensburg Road – In advance of the impending battle, President Madison and his entire cabinet journeyed to Bladensburg to watch American troops beat back the British. This collection of major historical figures from the American Revolution included Francis Scott Key (who was an aide to General Walter Smith). The President and Cabinet, after seeing the American first line fall apart under British attack, retreated from the field under the protection of the Second Line. About 3000 American Militia were relocated to this “high ground” by Secretary of State James Monroe, effectively taking them out of the conflict. (Monroe would become the 5th President of the United States and had been granted a field commission of Colonel.) Too far from the first line to effectively support them, the militia units retreated west through the field and on Bunker Hill Road after the first line units fell back from the British advance. The line of troops were staged from roughly the Cottage City Town Hall (stop 3) well into Colmar Manor on the other side of the Bladensburg Road. Cannons were in place just ahead of the troop line, roughly at 40th Place. “Bladensburg Races” – This satirical poem, written in Britain in 1816 was directed at Monroe and Madison as ineffective leaders who left their troops on the field of battle. The battle was never known as the Bladensburg Races during the time and the intent of the poem was pointed at the President and future President more than the American troops. Stop 5 – Dueling Creek Skirmish – Bladensburg Road and 38th Avenue – After skirmishing briefly with Kramer’s Militia (a group of troops assembled from around Prince George’s County) at Dueling Creek, the British, faced with heavy fire from U.S. Commodore Joshua Barney’s cannons above them, broke ranks and spread out in a thin line as they proceed up the hill eventually outflanking Barney’s artillery positions on the Third Line and converge on Barney’s position in the middle of the road. Dueling Creek is so named because of the dozens of duels fought there between 1808 and 1868. There may have been in excess of 26 duels fought – unrecorded and lost to history. The most famous duel was fought between Commodore Stephen Decatur and James Barron in 1820. Both were injured and Decatur would die from his injuries. Francis Scott Key’s son was killed as part of a duel. Dueling was generally outlawed in most states and the District of Columbia. Duelists would cross the border, often have a drink in Bladensburg, and perform the rite. The creek was channelized as part of the flood control projects in the region – which also changed the route of the Anacostia River. A small portion of the creek that retains its historic feel is on the other side of Alternate Route 1, but there is not a good path or way to view this historic water source. Stop 6 – The Advance up the Hill – Fort Lincoln Cemetery Entrance – At this point, the British were receiving heavy fire from Barney’s troops at the top of the hill on Eastern Avenue. This would have been a point where the British would have been enveloped by the fog of war – smoke, noise, bullets, cannon fire. The heat of the day, said to be nearly 100 degrees, would have been a major set back as the British tried at least three times to advance up the hill before forming their new ranks. Stop 7 – Barney’s Marines – Corner of Eastern Avenue and Bladensburg Road – Commodore Joshua Barney and his troops had marched overland from the Patuxent River, nearly 30 miles away, where they had scuttled their ships to avoid capture by the British. They arrived moments before the battle began and set up a line on or near Bladensburg Road. Here his Marines and their large 18 pound cannons were positioned best to fire down on the British. As American troops retreated, Barney’s Marines implored them to stay and fight. 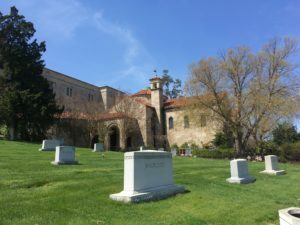 Though gravely wounded and ultimately defeated, Barney was commend his valor and was immediately paroled by the British leaders who allowed him to return to Bladensburg to see to his injuries. Barney would die several years later from the wound received on that day. 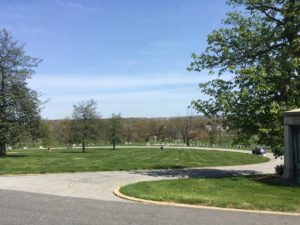 Stop 8 – Barney Monument – Inside Fort Lincoln Cemetery, stay to your right up the hill – Located at the top of the hill, behind the large mausoleum (built in the 1920s as part of the change from a boys school to a cemetery), is an early 20th century memorial to Barney and the Battle of Bladensburg placed there by the Marines. The monument is located near Barney’s right flank where U.S. artillery positions were out flanked by British troops during the last phase of the battle. Standing in front of the “Little Church” a visitor can start to understand the high point of the battle and where the British had to fight from to overtake Barney.